The Penn Quakers return to the Heps XC Championship setting as the defending champions, which they won at the West Windsor Fields of Princeton. 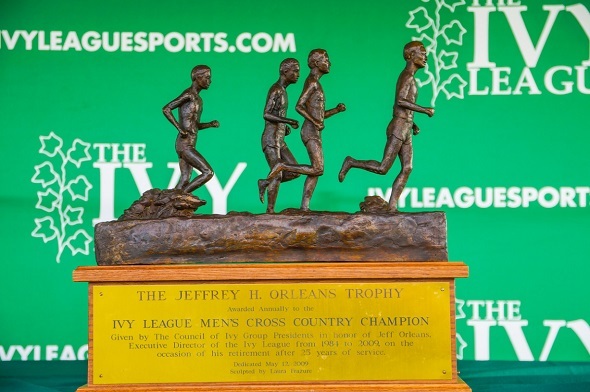 Van Cortlandt Park is different territory – the last time the Quakers were here for a HepsXC championships, they finished second as a team, only four points behind the 2015 team champion, Columbia. Like in 2015, we can see this team title battle between Penn and Columbia. Both teams return a few members of their 2015 squads. Columbia has four – Spencer Haik, Sam Ritz, 2017 Outdoor Heps 5k champ Ryan Thomas, and Spencer Haik. Ritz was the Lion’s final scorer in 2015. Meanwhile, Penn brings back six: Kurt Convey, Patrick Hally, Chris Luciano, Kevin Monogue, Sam Webb, and Ross Wilson. Wilson was Penn’s #4 runner back in 2015 at this meet. Van Cortlandt Park is Columbia’s home course, so they have the advantage here as they can practice on its legendary Cemetery Hill on a regular basis. Columbia has raced on it twice this year so far, with their best showing at the Paddy Doyle Meet of Champions where they won the team title (with Thomas getting the individual title), vaulting them into the national ranks for a few weeks. Penn traditionally keeps to smaller, more local meets at the start of their season and then start merging into higher tier competitions at the end of September. Columbia and Penn raced against each other at the Nuttycombe Wisconsin Invitational two weekends ago. Penn bested Columbia in that highly competitive field by a big margin as Penn had the faster #1 runner (Monogue) and Penn’s fifth man finished before Columbia’s third. Now, Penn is receiving national votes and is ranked #2 in their region, while Columbia fell from vote consideration. Sure, Columbia may have had an off-week, but if Columbia wants to make it back to NCAAs as a team since 2013, they will need to get their act back together on their home course. Penn has consistency on their side, but Columbia has the potential individual winner of Thomas and home course advantage, so we can see Columbia edging out Penn again for the trophy. Princeton may not have had as many head-to-heads with Ivy competition prior to Friday, but we cannot neglect to mention their dark horse potential. They sit right behind Penn in the Mid-Atlantic region rankings at #3, slowly climbing up as the season progresses. On paper, they have some fast men – Noah Kauppila is their #1 runner this year and is known for his middle distance speed; Conor Lundy was the fastest freshman last year (third at HepsXC, top Ivy individual at NCAAs XC) and has a lot of experience at VCP from his high school years; and William Paulson is the top returner from last year’s HepsXC championship (runner-up), just to name a few. They had a 20 second scoring spread at their own Princeton XC Invitational two weeks ago. The final 1km of the VCP will be compacted fast gravel path, so the Princeton strong kickers will likely steal positions in those final meters. Other squads who have already raced at VCP this season include Brown and Cornell, back in early September at the Columbia XC Invitational. Both squads had average 5 mile times around the 27 min mark. Those times won’t guarantee a team title come HepsXC but could place them in the middle of the standings at the awards ceremony. Cornell has the aid of a reliable 1-2 punch with Dominic DeLuca and Chase Silverman that could give Cornell the edge over Brown. DeLuca has been the Big Red #1 runner at the Paul Short Gold (where he was also the top Ivy finisher where the Ivy competition was only Penn) and PSU National Open races, while Silverman was the #1 runner at the Columbia XC Invitational. Brown has Martin Martinez as their strongest runner at the moment. While Matt Mahoney has been Brown’s #1 runner earlier this season, he hasn’t raced since the Battle of Beantown in mid-September, so his status is unknown at this time. Brown bested Dartmouth twice this season so far, as Brown got all five of their runners in before Dartmouth’s second man at both the Battle of Beantown and PreNationals. Dartmouth, Yale, and Harvard have yet to race at VCP this season. Patrick Gregory had been Dartmouth’s #1 runner for most of the season – the only time he was not was at Pre-Nationals, when he didn’t finish the race and Alex Kushen finished as the Big Green #1 in his stead. Dartmouth bested Harvard at the Battle in Beantown back in September, getting in six before Harvard’s second man crossed the line, but Harvard has the faster #1 runner in rookie Hugo Milner. Milner has led the Crimson in the two races he’s raced so far this season. Yale also has a fast frosh with Jon Lomagda, as Lomagda has been the top Bulldog whenever they’ve raced the 8km distance. Yale’s potential is a bit unknown at this time as they’ve had a bit of an up-and-down season so far. Five of their rookies completed an 18 second scoring spread at the Panorama Farms Invitational, placing them 5th as a team. Their next top tier competition was PreNationals, but they only had four finishers as three of their athletes did not complete their race. Hopefully those athletes recover for Friday’s race. Who do you think will win the men’s team championship? Take our poll below – we’ll share the results before race time on Friday. This entry was posted on Tuesday, October 24th, 2017 at 1:00 pm. It is filed under Featured, Heps Champs, Spotlight, Team Previews. You can follow any responses to this entry through the RSS 2.0 feed.